Then, I signed up for a Craftsy course called “Stupendous Stitching” which called for some extemporaneous hand embroidery, using big stitches and perle cotton. Well, once I didn’t have to deal with floss that refused to separate (and why on earth is it made that way?) and those trite blue stamped patterns I kind of got into it. Lazy daisies, French knots, stab stitches, fern stitch – bring them on. And I got to decide where to put my stitches. 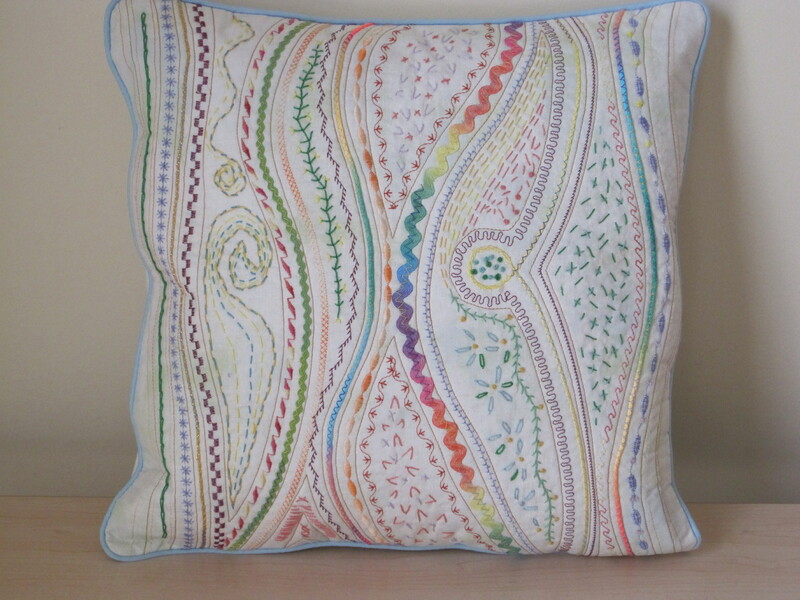 Here’s a pillow I made using that class’ techniques – couching, machine decorative stitching, hand embroidery, and quilting. Lest you think I hate fine embroidery, I don’t. I know one woman whose work is exquisite. She wins blue ribbons. It’s just not my thing.